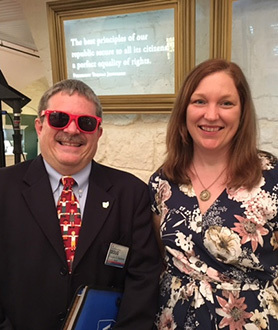 Kristen LePrevost (left, with Ohio CASA Executive Director Doug Stephens) was met with a standing ovation for sharing her story about Malachai, a young boy who was born with a rare congential disorder. Malachai’s condition caused abnormalities and multi-system issues. Managing his condition required the expertise of 12 separate providers; his mother was simply unable to provide the care he needed. Enter CASA and Ms. LePrevost. Although Malachai recently passed away, LePrevost recognizes that the experience left her richer. “He is a reminder that no matter how hard your case is, if you make a difference in one child’s life, you’ve done an amazing thing,” she said. “I am honored to be a part of this organization,” Ms. Prevost said. Ms. LePrevost is the winner of the Ohio CASA 2016 Pro Star Volunteer of the Year award.